How did the New Testament Church worship? Fr. 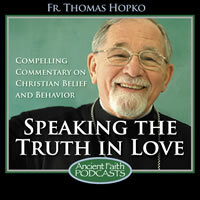 Thomas shows a specific structural practice that Orthodox worship today is based on. This is the second in a series of reflections on Church structure, Church order, particularly focusing on the ministry of the bishop, the place and ministry of the bishop, and, with him, presbyters or priests and deacons and then the saints and the charismatic people in the Church and the whole body of the faithful, the plēroma of the faithful. That’s what we’re reflecting on now. Last time, in my first reflection on this subject, I tried to set the stage, as it were, by saying that human beings, male and female, from the beginning were created to be prophetic and priestly and pastoral and royal, that we blew it. Humanity blew it from the beginning and denied their humanity, and denied their prophetic and priestly and pastoral and royal calling by sinning, by rebelling against God, by refusing to keep his commandments, by refusing to be prophetic and priestly and pastoral. So they made themselves fools, and we made ourselves fools. We made ourselves desecraters instead of consecraters. Instead of mediators, we became obstacles between creation and God and other people and God. And instead of being kings and rulers we became slaves and subjects to the very dust and earth and all the demonic powers that we were supposed to rule over. So that’s the tragedy. That’s how it was in the beginning. And we said last time—if you didn’t listen to it, go back and listen—that the Lord God Almighty didn’t give up on us. He kept working with us, and he found righteous people to interact with. He found Enoch; he found Noah. And then he finds Abraham, then he makes the promise to Abraham. And you have Abraham, Isaac, Jacob, Joseph, the tribes of Israel. You have Moses, the passover exodus, the tabernacle, the temple, the time in the wilderness, the crossing the Jordan, the entering the promised land, the building of Jerusalem Temple, the institution of the priests and all of the sacrificial rites. You have God doing all of that to reconstruct humanity, to make us again to be prophetic and priestly and royal and pastoral, and to know the truth and to do the truth and to glorify God. That’s what he wants from us. That’s what makes us human. That’s what gives us joy and happiness, peace, shalom of God—that’s how we get it. So God acts through all that, and then, ultimately, all this is for Christ, to produce Christ, who is the one teacher, the one prophet, the one great high priest, the one pastor, the one good shepherd, the one king, the one governor, the one bishop, the one overseer, the one apostle, the one everything. And as we ended our talk last time, we said Jesus is himself everything. He is the Adam. He is the lone humanity. He is the lone Jew. There is only one human being; there’s only one Jew—and that’s Jesus. You might even say there’s only one Christian and that’s Jesus. But what we want to see is that it all is fulfilled in this one person, Jesus of Nazareth, the Messianic prophet, the Messianic teacher, the Messianic priest, the Messianic king, who is prophet, priest, and king by giving himself over to the cross and to death and to suffering in order to destroy death and to raise the dead. So he fulfills all of his Messianic ministry, all of his divine humanity, on the cross. And he takes upon himself the curse and the sin of the world. He takes on himself the foolishness, the rebellion, the perversion of humanity in order to straighten it all out, to heal it, to cure it, to sanctify it, to glorify it, to make it be what God wants it to be from the beginning, and that’s what our Lord Jesus does. So we said last time that there is one priest, one bishop, one teacher, one pastor. There’s not many; there’s only one. But then we said last time also that by faith and by grace, we all participate in the one priesthood, the one prophetic ministry, the one teaching capability, so to speak, the one being very words of God ourselves as Jesus is. By grace and by faith we become everything that Jesus is by nature. He’s divine and human, and we become human, really human, and therefore divine, by communion with him and keeping his commandments through love and through his grace. We can’t do it without the grace; it’s all grace. What we said last time is that all Christians participate in the one prophetic and priestly and pastoral character of Jesus himself. But then we said last time that in the Church, in the Church as the qahal Israel, as the assembly of Israel on earth until the Lord comes again in glory, the Messianic community, the Church of Christ, there are some within the community who are ordained, consecrated, receive the laying-on of hands called cheirotonia in the Bible and in Greek, in order to be leaders of the Church, to be the ones who very specifically guarantee the presence of the Lord Christ in the community and his power in the community. Christ’s presence and Christ’s power in the community is guaranteed in the structure of the Church through the bishops and the presbyters and the deacons who are ordained for that particular purpose. Here we would like to make a theological nuance, a kind of a fine point which I consider to be extremely important. The bishops and the priests in the Church and, in their own way, the deacons, do not represent Jesus as if he were absent. It’s not a vicarious type of ministry. In other words, the bishops and the priests and the deacons don’t stand in the place of an absent Christ. What they do it, by their ministries, through their sacramental graces and powers and authorities, they reveal the very presence of Christ—not his absence, but his presence. They show that he is still there as teacher. He’s still there as prophet. He’s still there as high priest. He’s still there as king. He’s still there as good shepherd. He’s still there, doing all the things that the prophets and the priests and the shepherds and the kings are supposed to do for the sake of the salvation of humanity and the whole world. So I like to say that the clergy present the Lord Jesus. They don’t represent him, they present him. They image him, to use a good Greek Byzantine term: they image Christ. They’re the sacramental images of Christ. Here you could say it’s kind of iconic, but you’ve got to be careful, because it doesn’t mean they’re like photographic representatives or something like that, they have to look like Jesus with long hair and beards or something. That’s ridiculous, but what it means is that they have a modality, a form of sacramental reality that allows them to be the sacramental presences, communicating the sacramental powers and authorities of Christ himself, who alone has all power over it in heaven and on earth. But here we would say that to be bishop, priest, or deacon is not a charismatic gift. It’s a sacramental reality that belongs to the very being in order and structure of the community of the Church itself, that you cannot have the Church without bishops, priests, and deacons. You just can’t. Well, deacons here, it’s a question… But normally there would be those who minister as the hands of the bishop and do certain things that they are ordained to do. And in the earliest Church, some of the deacons were women. There’s no doubt about it: men deacons and women deacons, but not presbyters and not bishops. The presbyter-bishop was always a man, and a very particular type of man. So what we want to see now is: how did all of this develop in the earliest Church? What evidence do we have of this from the New Testament Scriptures, the 27 books of the New Testament, and what evidence do we have [for] this in what is called the post-Apostolic age? In other words, the end of the first century, the beginning of the second century, and throughout the second century: that would be called the [post-]Apostolic age, or the sub-Apostolic age, or however you want to call it, the post–New-Testament age. And here, that would be the age that would pretty much coincide with the centuries until Constantine’s conversion and the de-illegitimization of Christianity, and then ultimately the making of Christianity as the established religion in the end of the fourth century. So we could say the first and second and third centuries. Now, what do we see in those centuries, the 100s and the 200s, before you get to the 300s? What do we see there about bishops and presbyters and Church leadership and Church structure and Church order? First of all, we have the testimony of the New Testament writings themselves, and we have what are called the “pastoral epistles,” meaning the epistles that somehow show this structure. And they are the two letters to Timothy and the letter to Titus. And then you might add to that the letter to the Hebrews, where we see a very clear theological treatise about the unique once-for-all priesthood of Jesus Christ as himself the only victim, and then how that lives in the Church. “The saying is sure: if anyone aspires to the office of episkopos, bishop, he desires a noble task. Now, a bishop must be above reproach, the husband of one wife, temperate, sensible, dignified, hospitable, an apt teacher, no drunkard, not violent, but gentle, not quarrelsome, and no lover of money. He must manage his own household well, keeping his children submissive and respectful in every way, for if a man does not know how to manage his own oikos, his own household, how can he care for God’s church, the oikos tou Theo, the household of God? He must be not a recent convert (whatever that might mean) or he may be puffed up with conceit and fall into the condemnation of the devil. Moreover, he must be well thought of by outsiders or he may fall into reproach and the snares of the devil. Deacons, likewise, must be serious, not double-tongued, not addicted to much wine, not greedy for gain. They must hold the mystery of the faith with a clear conscience. Let them also be tested first, that if they prove themselves blameless, let them serve as deacons. The women, likewise (and the usual interpretation in our tradition is the women deacons likewise, not women generally, but the women who are doing diakonia, who are doing ministry and service), they also must be serious. No slanderers, temperate, faithful in all things. Let deacons be the husband of one wife, and let them manage their children and their households well, for those who serve well as deacons gain a good standing for themselves and also great confidence in faith which is in Christ Jesus. This is why I left you in Crete, that you might amend what was defective and appoint elders (here the word is “presbyters”) in every town as I directed you. If any man is blameless, the husband of one wife, and his children are believers, and not open to the charge of being profligate or subordinate. For a bishop (and then he uses “episkopos”), as God’s steward (oikonomos) must be blameless, not arrogant or quick-tempered or a drunkard or violent or greedy for gain, but hospitable, lover of goodness, master of himself, upright, holy, and self-controlled. He must hold firm to the sure word as taught so that he may be able to give instruction in sound doctrine, health doctrine, and also to confuse those who contradict it. Here you have qualifications for these positions. What we see is that here—and this is certainly true in the New Testament, generally—the word “presbyter” and the word “bishop” are almost used interchangeably. You could almost speak of “presbyter-bishop” as one and the same office. It will become distinguished very quickly, certainly by the beginning of the second century, but in the New Testament writings themselves, it’s pretty much indicating the same thing. It’s simply the one who heads the household, who heads the community. That’s what it is. Our understanding, Orthodox understanding would be: this would be the one who is not an apostle. And here, for our Church, it’s pretty much agreed upon that apostles, although having episcopal and presbyteral and diaconal functions—in other words, they were overseers and they were elders and they were ministers and they were servants—were not technically what we would call today “bishops” or “priests.” They were not. I think we have to really insist that, already by the beginning of the second century, the end of the first, the beginning of the second, that the bishop or elder, the presbyter or episkopos, presvyteros or episkopos, was the one that the apostle established to be the head of the Christian community. In other words, the first bishop of the community was not the apostle who founded the church. It was the man who was put over the church when the apostle departed. Here we have a good witness to this in the writing of St. Irenaeus in the third century, the 200s, where he says about the church of Rome, that it was the blessed church founded by the Apostles Peter and Paul, whose first bishop was Linus, whose second bishop was Clement, whose third bishop was Eleftherios, and he goes through the names of eleven bishops. But the first one is not Peter. And here, we have to say very clearly: for the Orthodox, Peter was not the first bishop of Rome. He was not the first bishop of Antioch, either. He was not the first bishop of anywhere, because the apostles were very particular, once-for-all ministry of announcing as eyewitnesses of the death and resurrection of Christ who had a very unique place in Christianity and that place was over when the last of them died. There were apostles who had to be eyewitnesses and servants of the word. There were the Twelve, headed by Peter. There had to be twelve because of the twelve tribes of Israel, but there were other 70 apostles. Some women were apostolic. Mary Magdalene is called in our Church an apostle: an apostle to the apostles. Namely, those who were sent to be witness to the risen Christ, the crucified and glorified Christ. “I exhort the elders (presvyteroi) among you as a fellow elder (synpresvyteros) and a martys (a witness) of the sufferings of Christ as well as a partaker of the glory that is to be revealed. Tend the flock of God that is in your charge, not by constraint, but willingly; not for shameful gain, but eagerly; not as domineering over those in your charge, but being examples to the flock. And when the chief shepherd (and there you’ve got it: the poimen, the good shepherd; that’s the pastor), when the chief pastor is manifested, you will obtain the unfading crown of glory. Likewise, you who are younger, be subject to the presvyteroi, to the elders. Clothe yourself, all of you, with humility toward one another, for God opposes the proud, but gives grace to the humble. Humble yourselves, therefore, under the mighty hand of God. And he continues. So you have this presbyter-bishop person in the Christian community from the beginning as a successor to the apostolic founders of the communities who head the local community. They function as the fathers, and even, in some sense, the husbands, of those communities. They present Christ there. They guarantee the presence of Christ. They exercise the authority and the power of Christ. And that’s why they’re even called episkopoi or oikonomoi, an oikonomos or an episkopos, because “episkopos” and “oikonomos” were names of household slaves. They were the names of servants. It’s really interesting that the heads of Christian communities were given the title that belonged to a servant at that time. And what did it mean? The episkopos was the chief servant in a household. An oikonomos was the servant who took care of all the master’s properties, monies, goods, and powers. Now, the men who held those positions were not the lord; they were not the master. The lord and master was Christ, but they did everything in the master’s name. They shone forth the master. They imaged the master. They presented the master. They were there, holding the master’s place, so to speak, showing that he was there, but not absent. In some sense absent, of course, but spiritually present: “I am with you always, even to the end of the world,” the Lord Jesus told his disciples and apostles. So the episkopos and the oikonomos, the bishop, the presvyteros, the elder of the community, was an overseer, a manager, a superintendent, a father. St. Paul says, “You have many teachers but not many fathers. I have become your father.” And these guys are fathers because they beget people to God through baptism and through their preaching and proclamation of the Gospel. These are very particular men. I’m stressing men because no women were included in this at all. Whatever some modern scholars try to prove and stand on their head to prove, you can’t prove it. There were no women at all, and as we’ll see through Church history, when there were sectarian Christian groups that had women bishops and presbyters, when they entered into the one [Church] that we believe was the true orthodox, catholic one, those particular women had to stand among the widows and the virgins. They couldn’t stand among the presbyters. They were not presbyters, and they certainly were not bishops. In Timothy and Titus and in Peter, it’s very clear that they’re talking about a man. A man, the husband of one wife. He could be a married man, he could have children, but he had to manage his household well. Without going through this in great detail, and I advise you to do it yourself: get Timothy, get Titus, read what it says about the bishop, and you will see that there are very, very specific qualifications: not any man could hold this position. As John Chrysostom would say, that position excludes most of the men in the Church, because they don’t have those qualifications, and all of the women, because they don’t have those qualifications. That would be the Orthodox Christian teaching, and that would be the ancient Christian teaching. It would certainly be the ancient Christian teaching in the orthodox catholic churches that we affirm and understand as succeeding. They may not have been, in some sectarian Christian groups like Marcionites or Montanists or Gnostics of various sorts, but in the orthodox catholic Church, that was definitely the case. And that’s why some modern feminist scholars say the orthodox catholic Church, the ancient Christian Church that we identify with, was male-chauvanist, and it wanted to be dominated by men, and it killed the real spiritual, mystical Christianity that you found in Montanism and Gnosticism. Well, we don’t believe in that. We think that that’s just simply totally wrong. And by the way, those same authors not only had women bishops and mystical leaders who were women, but they also basically rejected the Old Testament and they also basically rejected the Cross of Christ. One thing that really distinguishes Gnostic and heretical early Christian spiritualizing groups from the Church, the Church that we identify with and we are right now in the 21st century, is that their God was not the God of the Old Testament; they did not honor the Old Testament Scriptures; they did not believe in the real Incarnation of Jesus; they did not believe in his real Resurrection; they did not believe in the real crucifixion; they did not, because they said all this had to do with the male body, they spiritualized the whole thing. They did not believe in the real Presence in the holy Eucharist of the Body and Blood of Christ, and they certainly did not believe in the episcopate, the male episcopate and the apostolic succession. They did not even believe in the authority of the Apostles, because they were all men. If you want to read about this, read Elaine Pagels’ book, The Gnostic Gospels. She lays it all out there in four-part harmony. Orthodox catholic Christianity is a male chauvanist plot, according to her. The “real” Christianity were the Gnostics and the spiritualists. Well, people have to decide what is right and what is wrong, what is true and what is false. Our Church simply says Gnosticism and Montanism was wrong, and the churches of the Apostles and then such men as Ignatius of Antioch and Polycarp of Smyrna and Irenaeus of Lyons and Cyprian of Carthage and then, later on, John Chrysostom and Basil the Great and Gregory the Theologian and Gregory of Nyssa and all the holy Fathers, Ambrose, Augustine—this is the true Church; this is the real Church. The other ones are heretical and simply contrary to God’s Gospel in Jesus. What we want to say right now is that in the New Testament, you already have emerging what we call the three-fold ministry that belongs to the very structure of the Church. You have bishops, you have presbyters, and you have deacons. You may even have had a kind of a two-fold in the beginning: the presbyter-bishop and then the deacons. And the deacons were both men and women, most likely, because the Church had women deacons all through history. John Chrysostom in the fourth century he had, like, hundreds of them in Constantinople. They were the women who assisted the bishops with the baptisms with the women and put the chrism on the body and dunked the women in the water and so on. There were women deacons, and we know: Phoebe, Tatiana, Nonna, those were all deacons. They’re called deacons. And by the way, they’re called “deacons” in Greek; they’re not called “deaconesses.” They’re called “deacon,” but with a feminine article: “ho diakonos” is a man, and hē diakonos” (the same masculine word) is for the woman. That’s how it’s in the New Testament, and that’s why in Timothy when it says, “And the women also,” John Chrysostom interprets that as the women deacons, not women generally, but the women who were technically in the diakonia ministry, who were ordained for that purpose. And we know that by the third century, we have the service for the ordination of the women deacon, which was absolutely identical for the service for the ordination of the man deacon, except that the prayer for women mentioned Phoebe as the prototypical deacon (woman deacon), whereas the prayer for the man mentioned Stephen as the prototypical deacon for men. But staying in the New Testament now, we have bishops and presbyters and deacons. And they are not considered in the New Testament to be charismatic ministries. They’re not like charismatic prophets or speakers-in-tongues or healers or administrators or the people that you find listed in some of the epistles of St. Paul as the holders of the charismatic gifts. I can quickly find some of these lists of the charismatic members of the Church, and these charisms, they come and they go, and they’re given by God, and they disappear, whereas the episcopate, the presbyterate, and the diaconate become structures of the very Church itself. They belong to the Church’s very being. For example, in the Corinthian letter, the charisms would be: apostles, prophets, teachers, workers of miracles, healers, helpers, administrators, speakers in various kinds of tongues. Are all apostles, are all prophets, are all teachers, do all work miracles, do all possess the gift of healing, do all speak in tongues, do all interpret? Well, the answer, obviously, is no. And then the Apostle Paul says, but the gift that unites them all is love. And then you have I Corinthians 14. Some scholars would say, “Well, you see, there were different kinds of structures in the early Church. There was a looser structure like you find in Corinthians, and then there was a tighter structure like you find in Timothy.” Sometimes they even like to show that these were contentious parties in the Church, and they were fighting for their own way and all that kind of stuff, because almost all modern scholarship in the New Testament, they see everything in terms of controversy and quarrel and fight and fight-for-power. I think that’s sick, frankly; I think that’s just plain sick. I think our interpretation would be that, yeah, you had loose things in the beginning. You had Gentile communities like the Corinthians. But then when it became clear that the Lord was not coming back chronologically very soon and the Church was going to have settle down for a long, or at least a longer history in time and space and had been separated from Judaism by being expelled from the synagogues and becoming Christians as a separate Jewish sect, then they had to develop their own structure, their own order, their own way of existing, and that’s when you get the bishops and the presbyters and the deacons, and then they become universally part of all the churches by the end of the first century or the beginning of the second. It’s not for nothing that one of the first post-Apostolic writings that exist is a letter of the bishop of Rome to the Corinthian community, telling the presbyters they are to straighten themselves up and to get in order. In fact, someone once said that the Corinthian community was so wild that it made it into the New Testament the same way that Pontius Pilate made it into the Nicene Creed: for all the troubles they had. They had to be put in order. The Apostle Paul himself had to write to them and say, “I want everything to be done decently and in order. I want the women charismatics to be quiet in church. I don’t want many prophesying. I don’t want this tongue-speaking all over the place.” He already had to tell them that, already in the first century, already in the middle of the first century. So there had to be some kind of order brought to the Church, and one of the most amazing things, in my mind, is that by the time you get to the end of the first century and the beginning of the second, you have basically the same order in virtually all of the churches throughout the entire Roman Empire. From Rome to Corinth to Jerusalem to wherever, you basically have a church which is headed by a bishop. And in Jerusalem, by the way, it was James, the brother of the Lord, according to Tradition, even according to the Book of Acts. He’s the one who presided at the council in Jerusalem, because he was the bishop. And he’s always called the first bishop of Jerusalem. So you had bishops from the beginning. You had deacons and presbyters and deacons and ministers from the beginning, belonging to [the] very structure of the Church. And here I would insist on this: different from charismatic people. The Church always has charismatic people. The modern starchestvo, the eldership in Russia, was a charismatic institution, and they did lots of things—they preached, they [taught], they healed, they heard confessions, they gave advice—but they were not ordained clergy in the same sense as a bishop, a priest, and a deacon. Very often, they were in a little bit of contention with each other sometimes, because the bishops could get overly domineering, and the charismatics could get overly charismatic. But you have that already in the Old Testament: the prophets versus the kings, and all that kind of stuff, the priests… But it never was big animosity that meant that there were just different parties with different understandings of the faith itself. That is simply not true. And, just like in the Old Testament Ezekiel is a priest and a prophet, so in the New Testament, bishops like Cyprian or John Chrysostom are also prophets while at the same time being bishops. You had it there from the beginning. It’s in the New Testament. By the time you get to the end of the first century, as I just said, you find pretty much the same structure in all the churches. You have one of the presbyters becoming the leader of the community, and that’s the one who will ultimately be called the bishop. Then you have council of elders, older men, who exist as a council around the bishop. And then you have the deacons, and then you have other orders: you have the widows, you have the virgins, you have the women deacons. And you can see this in the letters of St. Ignatius of Antioch, written before 112. You see this in the apostolic constitutions. You see this in the Didachē. You see this in the writings of Hippolytus. You see this in the writings of Justin the Philosopher and Martyr. You find this witnessed to already in the 200s. You find it already in the 100s. You find it already in the second century. So if you’re interested in this, I would recommend that you read the seven letters of St. Ignatius of Antioch. He was the bishop of Antioch who died as a martyr in Rome. He wrote seven very, very important letters about the earliest Church, and in these letters, he uses “bishop,” “presbyter,” and “deacon.” He shows their interrelationship. He says that each community only has one bishop, or, as we might say nowadays, one “protopresbyter,” one leading presbyter who then comes to be called bishop. And then the term “episkopos” is only applied to that one, and then the other ones around him, who co-serve with him, and even celebrate Eucharists with his blessing, are called “presbyters.” In modern times, we’d call them “priests.” Then you had the deacons who helped, who were his hands, who carried the Holy Eucharist, who read the Gospel, and so on. But the bishop did the preaching, and then he would delegate to presbyters to do preaching. Then the presbyters would even perhaps preside at celebrations of Eucharist of the Lord’s Supper in the physical absence of the bishop. And that’s how the whole thing seems to have developed, according to Orthodoxy. This is what you seem to have, very clearly shown, in the New Testament. One thing’s for sure: it is what the Orthodox Church sees. Not what they seem to see, but what they actually do see. Our Church Tradition, this is the way we understand it. So you have the witness of Ignatius, and then you have the witnesses of others. I mentioned Hippolytus; I mentioned Justin the Martyr, but two others that really need to be mentioned are Cyprian of Carthage and Irenaeus of Lyons, both of whom lived in the 200s, in the third century, and even overlapped the centuries, because they give us very, very interesting data and understanding about these bishops and about what they were doing and about how the Church life was organized and how it was interrelated in space and how it was kept intact in time, because human beings live in space and time. The Christian Church is priest over all the world, so you have churches in different places. How did the churches in the different places relate to each other? Then, of course, from the earliest time, you had problems about that. From the earliest time, for example, the Church of Rome, because of Peter and Paul and because it was the imperial see, tried to have certain prerogatives over other churches, like over the church of North Africa and Carthage. I’ll mention that in a future reflection. You have the seeds of what you can call the modern papacy already in the third century. This didn’t come from nowhere. But then you also had contestations between bishops: whose territories is whose? So you had this whole problem of when the Church gets spread out through space, and different towns and different cities have Christian communities, how were they structured interiorly, and then how do they relate to each other? How do churches in particular regions relate to each other? Then you have the other problem: how do they relate when the bishop dies and they have to keep on going? Not only how do they relate in space, but how do they relate in time? How is the integrity, the identity, the unity, the solidarity, the sameness of the Church with the same Gospel, the same faith, the same worship, the same sacraments, how does that persist in time? What happens as generations die and new generations come up? How does that all work itself out? So we have to reflect on that, and we will do that in our next reflection. But what we want to see for today, from the beginning, is, to use Bishop Kallistos’ formula that we mentioned last time: “You have one, you have all, and you have some.” One only is the Lord Jesus Christ. He is the teacher, the prophet, the priest, the pastor, the king, the governor, the master, the overlord—it’s all his. Then you have everyone who’s baptized into Christ and sealed with the Spirit, participating in Christ. They are in Christ. They have the gifts of Christ. They become by God’s grace what Christ himself is by nature. That’s not magical; it’s not mechanical, but by grace and by faith, by prayer, by fasting, by worship, human beings can become Christians, in other words. We can become, as St. Gregory the Theologian will say in the 300s, “little christs,” or “christs,” we would say in modern English, with little-c. There’s the Christ with the capital C, who was Christ by nature, and then there are christs with a little /c/ who are the Church. And this is all the men and all the women, even all the children, all the retarded people, all the sick people—everybody. It’s just everybody in the Church participates in that and actualizes it in his or her own way. And then, within that community, you have some who have particular gifts and charisms: healers, administrators, speakers-in-tongues, evangelists, and so on. But then you also have some who are bishops, presbyters, and deacons. The bishops and the presbyters are only men with the qualifications that you find in Timothy and Titus and the letter of Peter. The deacons are both men and women, and they also have the qualifications that you have in the letter of Timothy. That’s how we would understand it. Then these churches live in harmony. Ignatius would say they’re like a harp with many strings that play the one song, the new song, together. That’s how it is. We’ll talk about Ignatius a little more later. So then you have the some: some are bishops, some are presbyters, some are deacons, both men deacon and women deacon, deacons and deaconesses, we’d say in English. You have that reality and that belongs to the very structure of the Church. That belongs to the very structure of the Church. And we Orthodox see it as being there from the very beginning. It had to work itself out in the first century, but we believe it got worked out by the end of the first century, just like the New Testament canon got worked out by the end of the first century, just like the question about what to do about the Gentiles got worked out by the end of the first century, just like the relationship of the keeping of the works of the Law and circumcision got worked out by the end of the first century. It took time for this to work itself out; there was controversy. I always point out that Peter fought with Paul and Paul fought with Peter and Paul fought with James, and they had to have the council in Jerusalem and so on. It took time to work all this out, and it took time for the local Christian communities, once they were separated from the synagogue, to get their interior order, to get the order by which they would live in history, how they would be organized, how they would be governed, how they would worship. All this had to be developed,even baptism. By the end of the first century, you have all of the orthodox catholic churches of the baptisms being done in the name of the Father, the Son, and the Holy Spirit following Matthew. It was not done in the name of Jesus like some early Christians were doing. That became not the accepted method, although nowadays there are churches that baptize just in the name of Jesus and not in the name of the Trinity. But the churches that we identified with, the ones with the bishops and the priests and the deacons, also baptized in the name of the Father, Son, and Holy Spirit, and you had to be a baptized person and sealed with the Spirit to participate in the Holy Eucharist, in the Lord’s Supper, in the Paschal Meal, to eat and drink in the kingdom of God. The order of the Eucharist was developed at this time, too. So by the time you get to the end of the first century and the beginning of the second, you also have a pretty much universal order of the Eucharist in all the churches that we have records for. It begins with the psalmody and the proclamation of the word of God. Some local particular Christian hymns like the doxology and the trisagion, and then you have the offering of the Bread and Wine, and then the bishop pronounces the prayers of consecration. And these cannot be done by prophets. It cannot be done by wandering people. It’s got to be done by men in apostolic succession. That’s what we find in all the churches by the beginning of the second century and to the third century. That’s how it worked itself out as far as we can tell, and we can tell not only by the data that we have, by the records that we have, but because our churches organically move through that particular process themselves and it became part of the interior life of the Church. We read those documents of the second century, and we say, “Yeah! That’s just how it is!” That’s just how it is, still to this day. By the time you get to the 300s, you have descriptions of baptisms and Eucharists in various places like Jerusalem and Antioch and northern Africa and in Rome and in Milan, by St. Ambrose, that are virtually identical. Cyril’s and John Chrysostom’s and Cyril of Jerusalem’s and Cyprian’s descriptions of what’s going on, and Hippolytus’, they’re almost identical. And this is very, very early in Christian history. This is there from the beginning. It’s not something developed in the middle ages or something. It’s there from the beginning, but it had a long, long history through 2,000 years of Christianity down to the present time. That’s what we’re going to try to reflect on more as we move through this. So next time, we will move into the post-New Testamental period, and we’ll talk specifically about Ignatius and Irenaeus and Cyprian, or Ignatius, Cyprian, and Irenaeus, in that order, and then we’ll get into the fourth century, which then basically gives us the structure that we pretty much have within Orthodoxy in one way or another, with great conflict and controversy about how it’s to be interpreted, but basically you have that, and in the canons of the ecumenical councils just down to the present day. But that’s for the next time. But what we want to see today is that the bishop, the presbyter, the deacon, the structure of the Christian Church that was very fluid in the first half-century or so after Christ was worked out to the point where, by the end of the first century, beginning of the second century, virtually that structure became universal in all of the churches of Christ, in all of the communities that were—each one itself, fully—the catholic orthodox Church of Jesus Christ. Certainly the Church that we believe in, and that we believe that, even to this day, we are.